Cape Town attractions have made it a famed destination for many Hollywood & Bollywood stars and diverse global travelers alike. Take a trip to on the Cape Winelands and taste South Africa's homegrown wines; see the world from your vantage point on the top of famed Table Mountain; dine like a king at any of South Africa's fantastic restaurants and celebrate the great outdoors even during the winter months. 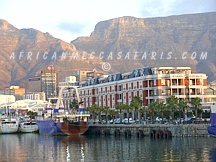 Below is a listing of Victoria & Alfred Waterfront & Harbor Vicinity Cape Town accommodations in South Africa. Commodore Hotel, a Legacy Hotel is where stylish living, excellent service and a tranquil setting comes standard. Enjoy breathtaking views of the charming 'Mother City' from the upper floors of the hotel's superior rooms or treat yourself to cocktails on the terrace. At Commodore, Escapism is not only a state of mind; it's a place of abode at the cosmopolitan Victoria & Alfred Waterfront in Cape Town. 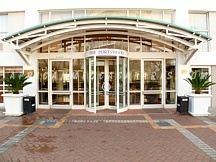 Portswood Hotel is the type of place where you are more likely to want to extend your stay. This elegant hotel not only offers superior accommodation and a relaxed atmosphere, but a uniquely personal approach to service. This commitment to service excellence extends far beyond the needs of the leisure traveler, providing all the amenities international business travelers demand. 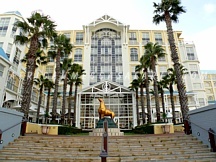 Radisson Blu Hotel Waterfront is spectacularly situated on the edge of the Atlantic Ocean offering sweeping views overlooking the famous Victoria & Alfred Waterfront, Robben Island and Table Mountain. The 177 rooms and suites have balconies and breathtaking views of the Atlantic Ocean. Free wireless internet access is available in all guestrooms. 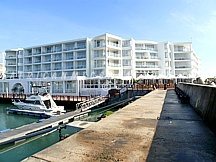 Table Bay Hotel is a Sun International Hotel. 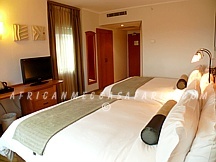 That means you can expect nothing less than the highest level of service and enjoy a myriad of superior activities. In everything Table Bay does, it aims to exceed your expectations, allowing you to escape into the romance and luxury of your journey. 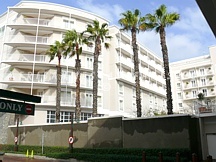 The Table Bay Hotel has a total of 329 fully air-conditioned rooms which include single, double, luxury rooms and suites. 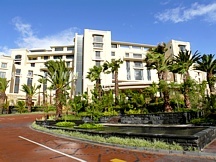 Southern Sun The Cullinan Hotel - is an elegant and stylish hotel, ideal for both business and leisure travelers. Since The Cullinan is situated at the entrance to the exciting V&A Waterfront, it offers views of Table Mountain, the bustling harbor, the Waterfront and the city. The Cullinan complements the rich, cultural heritage of Cape Town with a timeless architectural tradition. 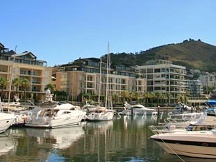 Southern Sun Waterfront is ideally nestled between the majestic Table Mountain and the Atlantic Ocean. It is well sited close to the entrance to the city's premier leisure complex - The Victoria and Alfred Waterfront, and is a short 15-minute drive from Cape Town International Airport. A variety of beaches, as well as the city centre, are also within close reach. 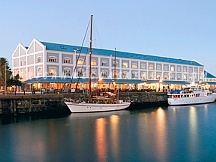 Victoria & Alfred Hotel is perfectly situated in the heart of the Victoria & Alfred Waterfront offering spectacular views of the working harbor and Table Mountain. Walk in the utmost safety to some of the finest retail outlets from designer stores to restaurants, craft markets, cinemas, boat cruises to Robben Island and entertainment in the amphitheatre. Waterfront Village is situated on the water's edge in the picturesque marina and offers a unique and exquisite setting. It is located in the world-renowned V&A Waterfront in Cape Town, next to the Cape Grace Hotel and One&Only and within walking distance to newly launched maze and Nobu, acclaimed international restaurants by Michelin-starred chefs Gordon Ramsay and Nobuyuki Matsuhisa.